This entry was posted in Humor, new york city and tagged afternoon tea, appliance repair, brunch, loud restaurants, low lighting, noisy as a jet engine, Upper West Side. Bookmark the permalink. 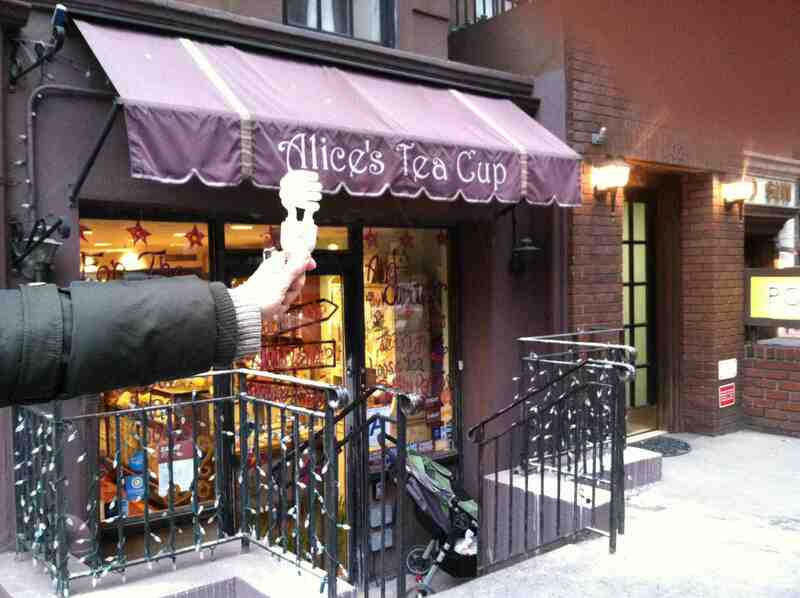 Alice’s Tea Cup sounds like such a great idea, without all that noise, though. Ambience isn’t improved with increased decibels. But popular places do get noisy. I could definitely go for a pumpkin scone. Thirty bucks is a lot of dough to fix a lamp, but if it’s your favorite lamp, then let there be light. I feel a bit random and all over the place this morning. I need more coffee. I don’t think it could have been much louder if we were sitting on an active runway at LaGuardia airport, Jean! I’m hard of hearing as is, most of the patrons were under thirty so the yammering was several octaves higher than Lola and my baritone blatherings that comes with being a combined age of 106 and 40 years of red wine quaffing. They charge $20 for labor and the parts will be between five and ten clams. I love that lamp. If it lasts another fifteen years, it will probably outlive me. Then save the lamp! It’s not a lamp, it’s family. Or maybe the closest thing I’ll have to a pet in my no animals allowed (well, cats are okay but I’m deathly allergic) building. At least I’ve only had to walk my lamp twice over fifteen years: to the hardware store for repair and from the hardware store following aforementioned repair. Because it was a gift from my ex, Voom, she delivered it to me. I highly doubt my lamp will ever hum the Beach Boys’ “I Get Around”. Or maybe it will, after I completely lose my mind. Thanks and no thanks. I’m happy with my lamp. It goes well with tea. I can empathize with the hardware store thoughts. Before using my snowblower this winter (seems like a loooong time ago), I turned on the switch, pressed the primer button several times to get gas into the sparkplug place, and pulled really hard and fast many times on the cord. All was to no avail. Meanwhile, two neighbors came over and cleared my drive in 30 seconds, or so it seemed. I called the shop. He said bring it over. They would get it running. Melanie and I struggled and loaded the beast into the back of her SUV and drove there. The service guy (gorilla-like) grabbed it and set it on the ground. He did exactly as I had done at home. It started for him first try. By the way, he was not wearing wings on his back. Although, that would have made things more interesting…a gorilla with wings. Humiliated by a great ape. I feel your pain, Jim, but look on the bright side, he signs his name with a thumb print. Now I must excuse myself to bleach the image of a gorilla with angel wings out of my mind. Thanks for another NYC Lame Adventure! I would have to get a tetanus shot before allowing that rusty fossil entry into my abode, R! I’m quite content with my brushed chrome and cherrywood lamp, and will be more pleased with it in a few days after it’s repaired. My main objection to CFL light bulbs is you can never have a great idea. Unlike the old fashioned incandescent bulb, where it was obvious to everyone that you just had a bright idea, the CFLs leave the impression that all your ideas are screwy. How can I expect anyone to take me seriously? Dear In the Dark in Arkansas, but my ideas are always a little screwy. You would have appreciated the blank look when Danny asked me if it was a halogen light. I explained, “It uses one of those squiggly-type, organic-like light bulbs.” He said, “Just bring it in.” I think he knew what he was dealing with in terms of lamp and customer: a dead light and a dim bulb. Maybe if you placed the bulb in your mouth ala Uncle Fester you would have been seated immediately! Who doesn’t love Uncle Fester and the bulb trick?????? I had suggested to Lola that we do just that, Max! She said, “You go first, but after we’re seated.” She did not want to jeopardize our trying to gain entry for the 97th time. 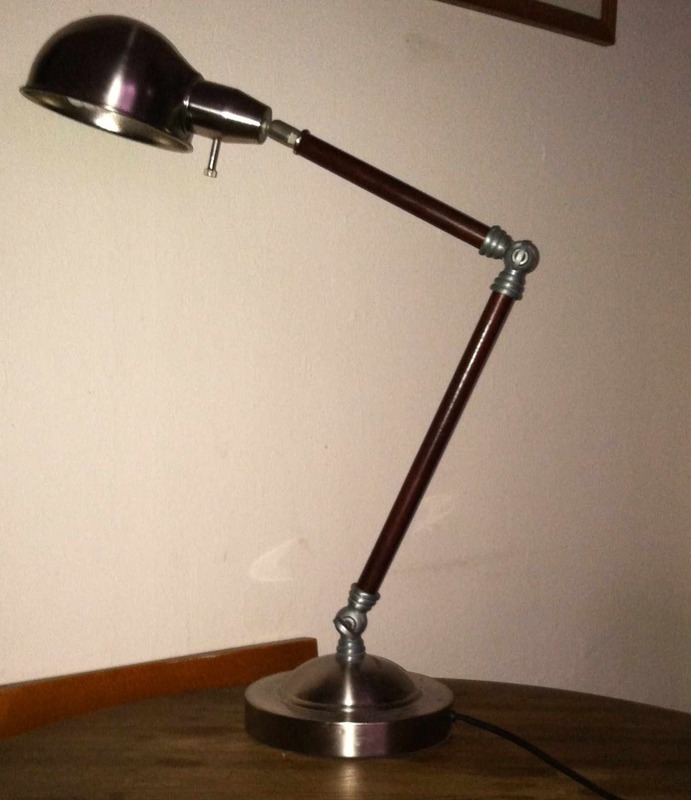 You could get a new lamp for half the price of the repair….just sayin. Also wondering how you could eat butter but not cream considering butter is made from cream???? I am sure I could get many lamps I loathe for pennies on the dollar, but considering that my entire apartment is not much bigger than the base of that lamp and I will have to look at this object every day, I’d rather pay thirty clams for the repair without suffering residual nausea. 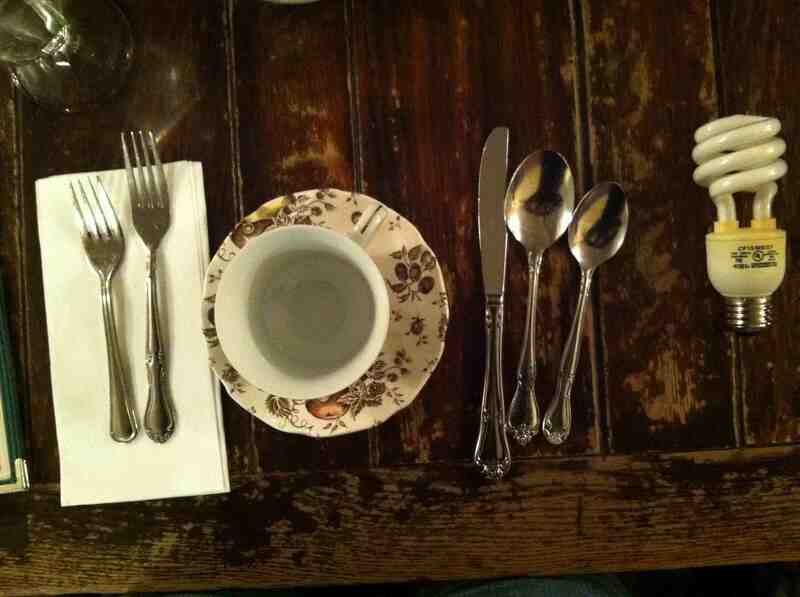 I’m hard of hearing and after dining at Alice’s Tea Cup well on the way to becoming deaf as a post. I have never heard any of my light bulbs. It’s a miracle when I can hear my buzzer. Lame-o, once again, you disappoint, but in a good way! I can’t believe you haven’t questioned (railed against?) those ridiculous paper doilies they put under your, uh, buns! I mean you’re going to schmear that with jam and a non-lethal dose of clotted cream, and whatever other sticky stuff they serve at over-priced tea shops, it’s going to get on the doilie, you could easily accidentally swallow a piece of raspberry-flavored doilie and then you’d be dead. And then we’d talk about Lame-o dying in a tea shop with her light bulb???? Uh, no. Don’t go there again. If we’re going to ever lose you, then it should be because you ran into a lamp post (unlit, of course) while perusing dead gum splats on NYC sidewalks. We know you do that so don’t try to deny it!! If I ever get around to attempting suicide, TT, thanks for the tip about ingesting a doily. That would be so much less complicated than squirrling away prescription meds. Lately, I’ve been back to focusing more on bags frozen in trees. This wicked winter there’s been too much ice and snow on the sidewalk to search for gum splats, but rumor has it that spring is coming and we may one day see forty degree temperatures again. I rather enjoy testing the range of my own lactose intolerance. But no, tiny, hoity-toity places are no place to pay homage to porcelain gods. What you rather enjoy rather scares me. I am hung up on the wings; why do people want to wear wings for fancy tea? No. Gloves, maybe. Hats, even. Wings? Seems out of place at best. At any rate, I am glad you avoided gastro distress and that your lamp is on it’s way to being fully functional. RG, in the case of the young girl, she was also wearing a tutu. 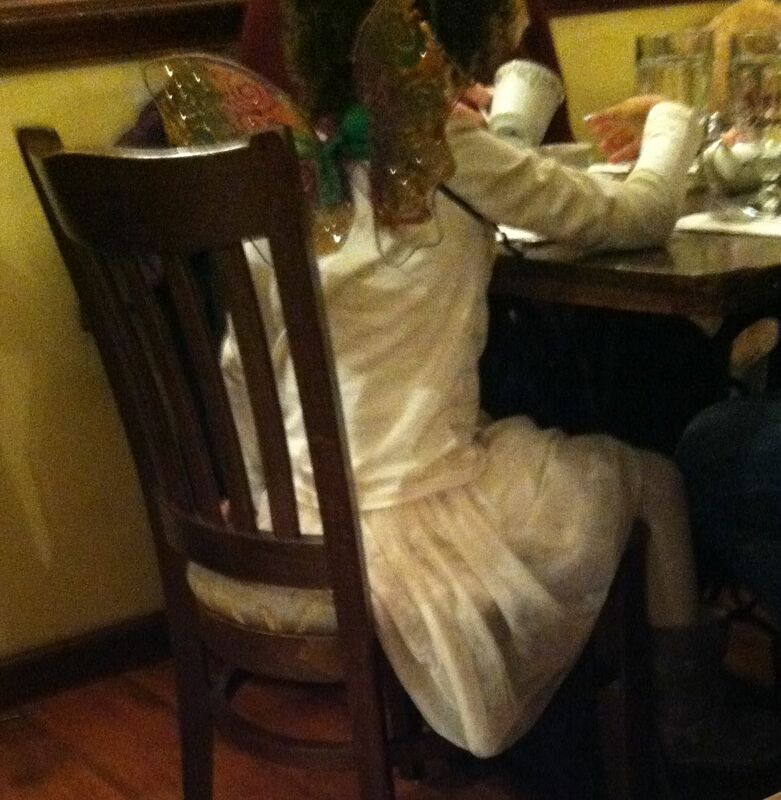 This was a kid that was completely in her bliss with the fairy tale ambiance. Her parents were there and I must say that her dad seemed to be a very good sport. Never once did I have the impression that he was feeling tortured. 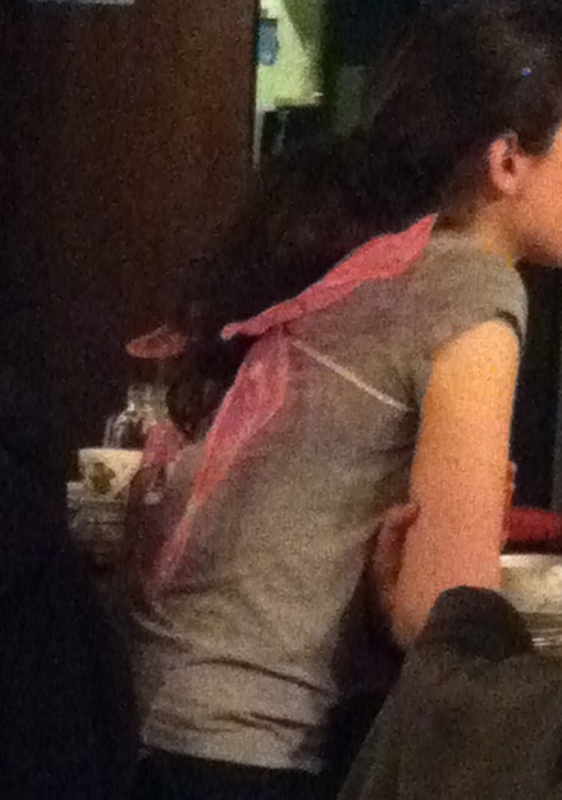 In the case of the woman between 25 and 30 with the A cup wings, she obviously needs wing implants and therapy. The Amish reference might have asuch to do with the narrow array of your clothing color palette. Of the about 8 patrons with testickes, how many do u think we’re dragged there against their will by their wives, girlfriends etc? Any of them sprouting wings? I’d have to really screw the pooch (yes, metaphorically) with the bride to be subjected to that horror show. 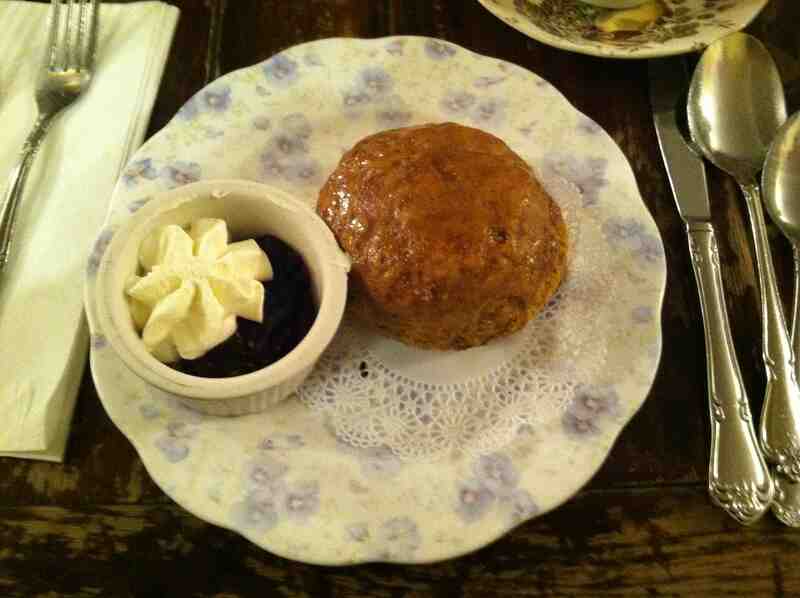 Although I do like a nice scone. Sort of reminds me of my Sunday afternoon from 4:10-4:55 sitting with Archie outside the Starbucks in Glen Ridge whilst D2 and her mom were inside imbibing warm liquids. What is so hard for people to understand that when an Open House is from 12-4 that you really ought to show up before 3:58? Luckily it meant we had scads of potential buyers (read nosy sorts who just like looking at houses). But I had to wait till 5 to go home. Anyone wanting to move into GR, check out our place at zillow.com or trulia.com. Address withheld cuz it’s probably tacky to troll for buyers this way. But if you’re adept at either site just put in a price range starting north of $1.5mm and it’s possibly the only one in inventory at this point. What is about you guys and this post?!? R and patriciatsouros are shilling lamps and now you’re SHILLING A HOUSE HERE?!?! I allow pontificating about baseball, even when it’s not my team, and meanderings that go so far off topic they might as well be taking place on the moon, but reminder: this is Lame Adventures, not Etsy or Coldwell Banker (or zillow or trulia). Back to regularly scheduled lunacy. I did not notice any guys wearing wings, but in New York, I would not rule it out, but wing-wearing males were not evident in our gang of eight. Some guys looked so pained they could have been wearing invisible crowns of thorns. As mentioned the foodstuffs and the tea were excellent. While we were waiting I did notice that men have latched onto the take-out element, so guys have figured out a nice way to escape the frills. I can’t go anywhere where I have to wait in line or if I do acquiesce to the line waiting, it better be PERFECT food. Perfect. Why are lamps so expensive? Expensive? My lamp was a gift, but I don’t think springing for a light fixture that one loves (and Voom, my ex who gave me that lamp for my birthday almost 15 years ago, knew I had quite a ladyboner for it) and will treasure for years is a bad idea. I see it as an investment in one’s home. At times, that lamp was the only decent looking think in this garret, but over the years I decorated around it. hahaha you used ladyboner!!! I just think lamps are expensive. I love them. I love lamp (what movie). The first Anchorman! I have yet to see the sequel which I know has been, or already was re-released with all new jokes recently. I swear, there is SO much to like about this post. First the title–do they get any better?! Secondly, the lighting theme. You see (pun intended) our friends Juan and David are renting a furnished house here in Cuenca, so they are living without a lamp in their bedroom. I know it might seem a non-sequiter, but then, the logic is theirs, not mine. You see, they say that if they are paying for a furnished house they are not going to invest in a lamp. We try to point out, every time Juan complains about not being able to read in bed, that they plan to live here the rest of their lives, then they might as well buy a lamp now. They have now gone 10 months without one. Now they are renting out a room in their house to overnight guests. Their ad mentions that the room has a “real bed,” whatever that means–no mention of a lamp, real or otherwise. We told them they need to add a note that reminds guests to “bring a candle.” Now I know this comment is not funny, but somehow Sara and I giggle every time with talk about the lamp issue. I have no idea why. Enough said. Glad you like this post, Kathy. Maybe Juan and David are guys that just prefer the darkness? Or, second, guess: they’re Amish rebels in Cuenca. I’m glad you dodged a bullet. That was a close one. Fancy tea… Are wings mandatory ? I did not get the impression that wings are necessary, but if I ever go back maybe with you [crank up the laugh track there], I will pack my horns. Yes, you know exactly what I mean: my tuba and trombone. Glad you only had to drop $30 for your PB because if you bought the same PB lamp, it’d probably set you back a couple hundred. The tea place looks whimsical like somewhere Shirley Temple would have tapped into in those movies she played a street urchin. Tres chic, V and thank God you didn’t drop the dangerous twisty mercury filled lightbulb. I’m so sorry you’re allergic to clotted cream because it is soooooooo good. That taste I absently had of that clotted cream, Brig was indeed “soooooooo good.” Yum! As a former New Yorker, you know exactly what the cost of living is like over here. Thank you for recognizing that a $30 repair is indeed a good deal. I was prompted to check out the lamps on PB today. You’re right. They all cost a shedload more, and none rock my world like the one that’s about to be resurrected. If all goes well, my niece, Sweet Pea, will inherit this light source. No offense, but given the noise level and estrogen overload, I’ll pass … but I enjoy tea and a baked good. Cheers to the power of the light bulb. I think you’d be one of those wise (thinking) guys that realized that take out is the way to go with this place, Frank. The tea selection is excellent and the food is very tasty. And then you could trot over to Fairway a block away to pick up a pint of Graeter’s. I have a lamp that I got for free at my first job ever at Restoration Hardware. That thing is one of my prized possessions (mostly because it’s made of steel so it’ll never break) so I can identify with your need to get yours fixed too. Emily, I’m sure that was a nice score at RH. My hovel’s ceiling light is from them. It nicely compliments my PB desk lamp. Although I’m of modest means, I do like nice looking stuff, but getting it for free, that rocks. I’m impressed that you and Lola made it inside Alice’s Tea Cup. I’ve been trying to get in there since 2005. Maybe it’s because I never brought my fairy wings. Or my light bulbs. Next time I’ll try some masking tape. Hey, you never know. Here’s the secret to gaining entry: have a friend like Lola who puts a lot of thought into things like this and after umpteen rejections, creates a strategy. She ascertained that getting in at brunch-time proper, 1 pm-ish, was impossible. We tried most recently at 3:30 on a Sunday after the horde of brunch-goers thinned, not to imply it wasn’t crowded. It was packed, but 3:30 had a much shorter waiting time. 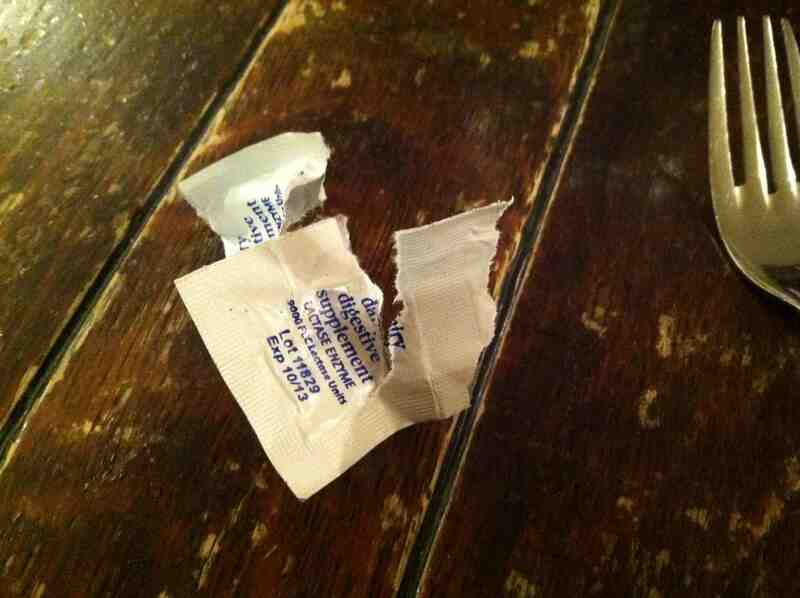 Also, bring your masking tape. Maybe it will be a good luck charm, or maybe you’ll be asked to leave and not come back depending on where the host/hostess rates on the attitude-o-meter. Sorry I’m late, V. It’s been a busy week and we’re leaving tomorrow for our three days of skiing (which we’ve been doing every other week this season). Glad you’re able to get your lamp fixed and somehow it all worked out well even with lightbulb in hand. 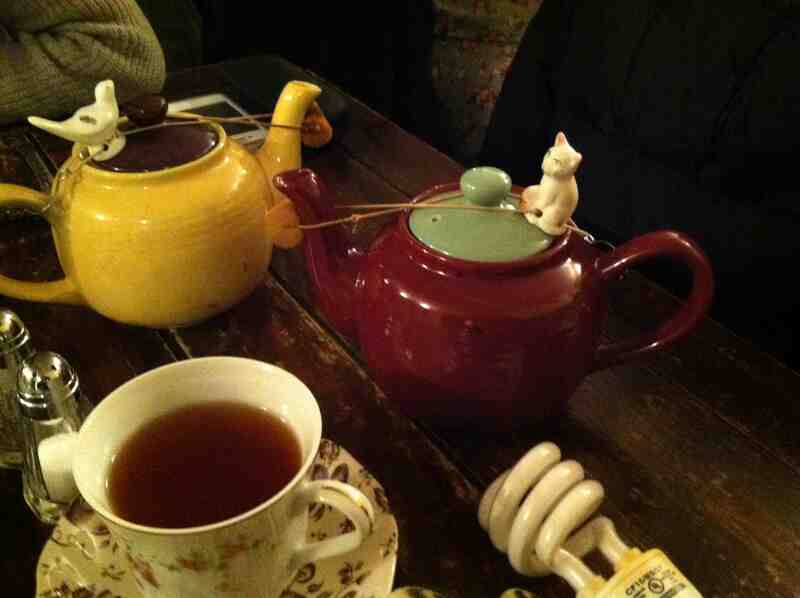 I loved the teapots – perfect for a Victorian tea parlor! 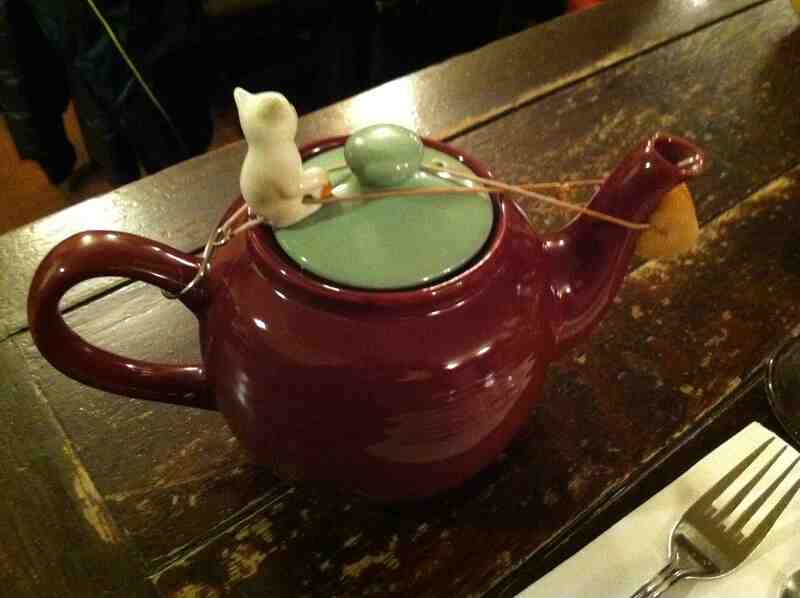 We liked those teapots a lot, too, Cathy. They would have been perfect if they came with earplugs. Have a great time skiing! I love the idea, sounds fabulous actually. Black Tea is the only tea I will touch. Pumpkin anything, just no but Clotted Cream, oh please give me more. I am so sorry you can’t enjoy this wonder. We had a good time. I did think that that tiny taste I had of clotted cream was the best tasting butter ever, Val, but I’m very, very thankful that it didn’t rip a hole through my guts later. I would love the tea room I think, but without the wings. That kinda creeps me out. We didn’t have a microwave for years. Someone gave us one last year and I used it for storage. I just don’t like them. My reading lamp isn’t doing that hot either. It was damaged in our move and you have to stand it just right or it’ll topple over. But I don’t want to pay for a new one. Maybe we’re related. Except we own a TV. We love sports too much. Alice’s is a very pretty place but the noise level is equal to that of a jet engine. My ears were hurting afterward. I could live without the wings, too, but that’s probably because I’m about as whimsical as a tumor. I would like to have a TV in time for Wimbledon. LA, I think you may have started a new trend with your light bulb. Well, those women were wearing wings, for whatever reason – one of which may have been that when you fly, you feel light. You were just feeling light in a different way. Hehehe. This is why I’m not a comedian! Sorry about the lactose intolerance though – that was a close call. Lucky for you that you had those emergency pills on you. I think you nailed it, Tom. Lola and I were both feeling light “in a different way”. We are not members of the winged creatures club. Your light bulb is far better traveled than I am. I wish I were a light bulb. Maybe you can live your wish. Halloween is only a mere seven months and twenty days away. 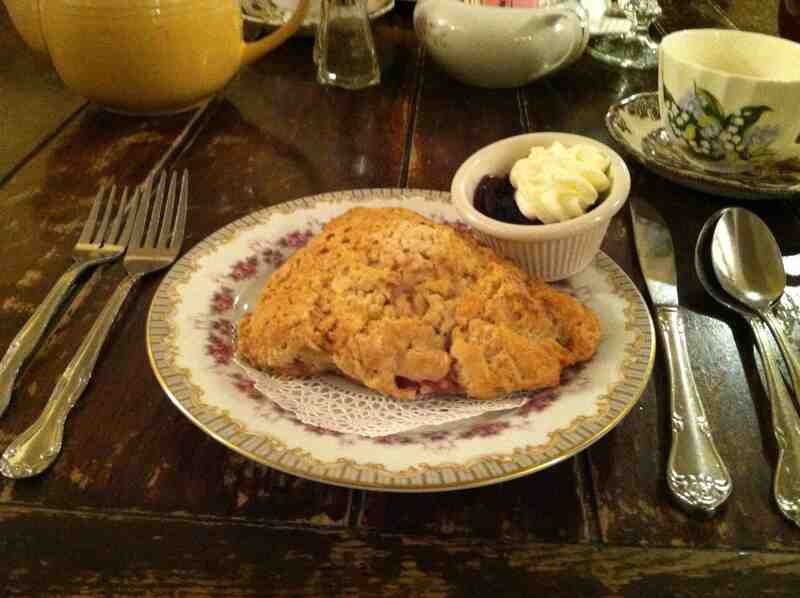 Believe it or not, I’ve never had a scone before. Yes, you read that correctly. Not even a Canadian version? Which would be…I don’t really know. Wendy, that might not be so bad. Scones have a very short shelf life before they go from dense and tasty to having the consistency of an anvil requiring three dental visits. Ew…..ok. That sounds too complicated to me. If you never taste a scone, Wendy, I’m sure you will still be able to live a completely fulfilled life or else I’m not a direct descendant of Rufus T. Firefly. If that lightbulb would have exploded in your pocket, you would have needed Hazmat!!! I never put my light bulb in my pocket, Susie, and it enjoyed a place at our table as Lola and I chowed down on scones and struggled to hear each other. Now, my light bulb is back where it belongs — shining brightly in my repaired lamp. You have Roxy, your dog, and I have my light bulb. I’m calling my light bulb “Epic”. According to my calculations, I’m only about 4,200 hours into its 15,000 hour life span. Glad the light bulb is rehomed, and that the cream was intercepted. Alice’s looks fab though. It never ceases to amaze me what New York offers if you know where to look. You’re right that New York has so much to offer, Kate, if you know where to look and you’re willing to wait. One day I should write a post where I calculate how many years of my life I have spent waiting to do what I want to do in this storied metropolis. Dude. I love this story. I like the fact that you were finally able to get in and that it only took fifteen minutes. It must have been you’re good luck charm: the light bulb. 🙂 That is an awesome little place. I need to investigate to see if they have such an estrogen-powerhouse tea place like this over here, I mean other than the American Girl Doll place which totally gives me hives just thinking about it. I can’t handle dolls, let alone the kind that cost over a hundred bucks. Hives I tell you. Hives. 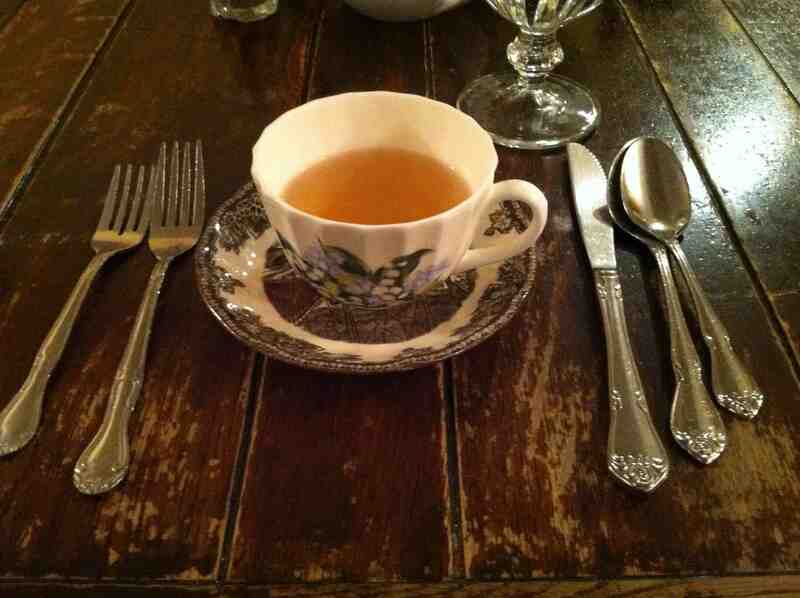 The food and tea are excellent! They have a book that you can look through at your table that is packed with their comprehensive selection of teas. It rivals Ulysses in length. They also sell tea and scones to go if you want to save your hearing. Take-out is one way to avoid bleeding ears. You’d likely dig Alice’s Guat. The food and tea are excellent and the Alice in Wonderland old world ambiance is lovely, but the big drawback (aside from the wait-time) is the noise level. It’s so loud, it’s like sitting inside a jet engine. There is an American Girl store/restaurant on Fifth Avenue. I have never gone near it. I am certain that it would give me hives, too.